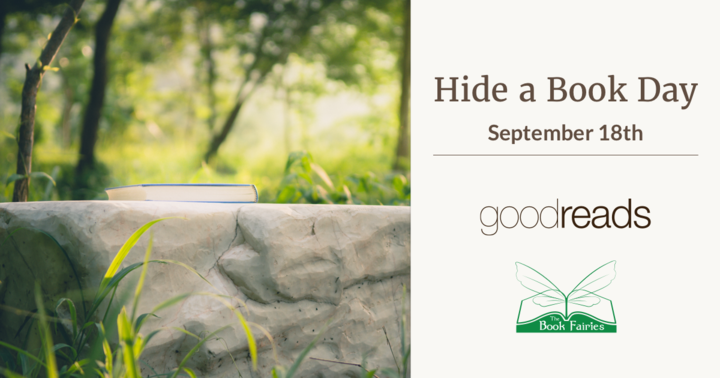 As part of the Ten-Year Anniversary Celebration, Goodreads is teaming up with The Book Fairies for a special Hide a Book Day on Monday, September 18. Everyone has a favourite book (or in my case, a pile of favourites!). To share the love of these books, Goodreads and The Book Fairies invite you to hide your own favourite book for others to discover. You may have heard that Emma Watson did this earlier this year when she shared copies of Our Shared Self. Hiding best-loved books for others to discover has been a "thing" for quite some time now, publicised and promoted by The Book Fairies. But Monday the 18th of September will be a special event, where book lovers from all corners of the world will be hiding their favourite reads for others to discover. All you need to do is choose a book, and find somewhere safe (and preferably, dry) to hide it. To enhance your finder's experience, you could purchase stickers from the Book Fairy website, or write a handwritten note to slip inside. Once you've hidden a book, take a picture and share it with your fellow Goodreads members and Book Fairies on Facebook, Twitter, or Instagram using the hashtags #goodreadsturns10, #hideabookday, #ibelieveinbookfairies. This will help those local to you discover your hidden favourite read. I'm yet to select which book(s?) to hid next week, though I'm sure whoever discovers them will enjoy them too.